2015 is over! Hurrah for 2016! I made some goals for last year, so it’s time to check in with accountability. First of all, in 2015 I wrote 523,169 words on manuscripts and blog posts. This year, I’m aiming for 600,000 words. 1. “By the end of 2015, I want to either have completed, or actively begun work on, a YA vampire novel.” I have actively begun work on a vampire novel. The first draft of Biter is being released chapter by chapter for my Patreon patrons, but it will be available as a full novel once it’s written and edited. The only part of the resolution I didn’t keep is that it isn’t a YA, it’s an NA. 2. “I want to celebrate my return to running in 2015 by racing around the beautiful shores of Mackinac Island.” Nope. I used to run with D-Rock, but once she moved to Washington, I stopped completely because I wasn’t accountable to anyone. I’m disappointed in dropping the ball on this one. I really enjoy running, and eight miles isn’t that far to run. I don’t have any excuse here, like that year I injured my tendon and gave myself a pass. 3. “I’d like to get a tattoo that I drew.” I didn’t get a tattoo I drew. I designed a tattoo, with help from the artist. Doesn’t count, though, because I didn’t draw it. 4. 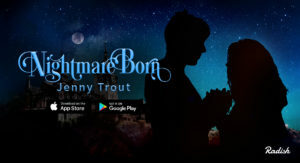 “Legally change my name to Jenny Trout. Do you have any idea how liberating it’s going to be to go from eighteen letters to ten letters?” What an optimistic idiot I was. I did legally change my name. I pulled that one off (go me!) but my name still doesn’t fit on forms. Instead of eighteen letters, it’s now twenty-three. Still, I’m super pumped to be Jenny Gallifrey Joel Trout now. 1. Reading Challenge Last year was a bad year for me, reading wise. I was in a total funk, and not just one of those “I devoured this book, now nothing else compares” funks. I just had a hard time picking a book and sticking with it. This year, in an attempt to combat that, I’m doing this reading challenge. 2. Take Weekends Off Toward the end of 2015, I got serious burnout. Burnout spirals me into depression. Depression makes me a person I don’t like. And when I don’t like myself, the burnout gets even worse. I made an effort to take the month of December off. I didn’t exactly stick to it. But this year, I’m making myself a strictly Monday through Friday gal. Weekends won’t be for work, but for just hanging out and Me Time. Hopefully this prevents further burnout. 3. Write 600,000 Words This might seem like it’s in direct contradiction to the whole “Take time off, don’t get burned out” thing, but I think that my new schedule will actually make me more productive, so this is probably totally do-able. 4. Tag Things On This Blog The lack of tags infuriates some of you. I understand. I’m just not good at tagging. I’m going to make an effort to tag stuff now. I probably will not go through and retag all my old entries, as this blog was started in 2008 or something and I don’t have that kind of time to devote to it. But I’ll at least try. Those are my goals for 2016. Nothing grandiose, but I’ve got to learn to stop sabotaging myself. Also, I’m going to knit and color more. Sometimes, without earning it.